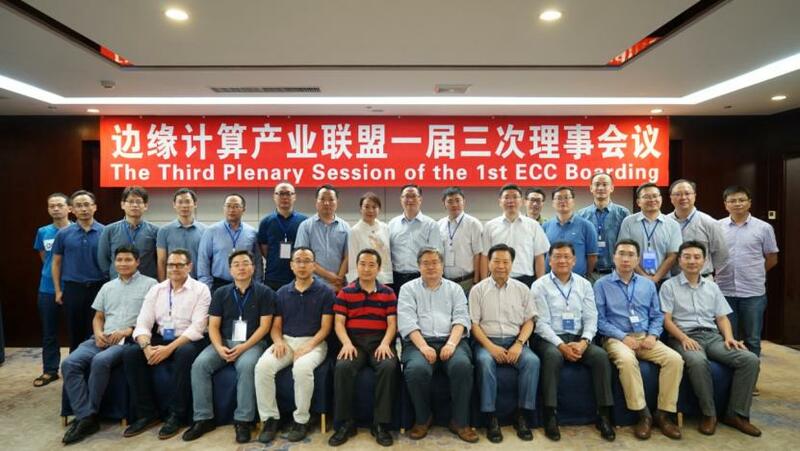 On August 17, 2017, the third plenary session of the First Edge Computing Consortium (ECC) Boarding was held in the Northeast University International Hotel, Shenyang, Liaoning. Representatives of executive directors and chairs of the ECC attended the conference. The representatives included Yu Haibin, Director of Shenyang Institute of Automation of Chinese Academy of Sciences, which assumes the roles of executive director and chair of the ECC; Liu Shaowei, President of Huawei Network R&D Dept; Chen Wei, General Manager of IoT Service Dept of Intel Corporation in the China region; Fang Fahe, Executive Vice President of iSoftStone; Luo Song, Chief Engineer of Service Resources and IoT Research Dept of Communications Standards Research Institute of Chinese Academy of Information and Communications Technology; Chen Xi, Sales and Market Expansion Director of ARM Holdings' s IoT Services Group; Chen Enyi, Director of R&D and Innovation Dept of Honeywell (China); Yang Qifeng, Deputy Director of Central Research Institute of Shenyang Siasun Robot & Automation Co., Ltd., deputy secretary general, and chairpersons of the working groups. At the conference, the ECC deliberated on and adopted the proposal of adding 16 council members, including ABB (China) Ltd., Anhui University, Beijing Etrol Technologies Co., Ltd., Beijing Panabit Software Co., Ltd., NSFOCUS, ICETech, Fujian Hongyang Intelligent Electric Co. Ltd., Guizhou-Cloud Big Data Industry Co., Ltd., Stratus Technologies, Inc., Sanjiang Electronic Co., Ltd., Aupera Technologies, Shenyang Hongyu Technology Co., Ltd., TONGFANG Cloud Computing, VIA Technologies, Xidian University, and SUPCON. The ECC also deliberated on and adopted the founding of the security working group and industry professional committees, and discussed the key work progress and plans of the ECC in 2017. In addition, Professor Thomas Magedanz of the Fraunhofer Institute for Open Communication Systems (FOKUS), special guest at the conference, made a presentation about FOKUS and its research into and comprehension of edge computing.